My Dad proposed to my Mom overlooking this view so the view has a lot of meaning for me. I was born and raised in Kamloops. The name “Kamloops” comes from “Tk’emlups”, which is a Shuswap indian word meaning ‘where the rivers meet’. So there are the North Thompson and the South Thompson rivers right there, meeting and mixing. 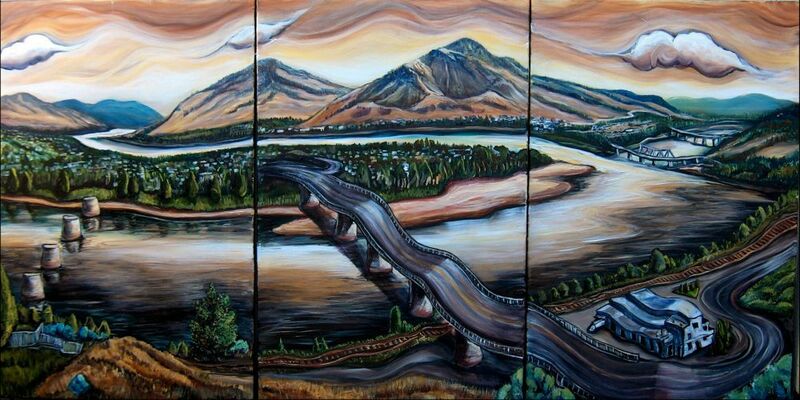 By the way, the Overlander Bridge is not that wiggly, but that’s my interpretive touch. Acrylic on Canvas, Triptych, (3 x 36″ tall X 24″ wide), so 72″ wide X 36″ tall – or 6′ x 3′. Is there a place that this can be purchased?